Dropping your drive will be totally fatal for almost any HHD. SSDs are slightly more durable because they lack moving mechanical parts. When you wrap them up in an enclosure, they can become even better protected. The right enclosure can provide protection that’s on par with the shell of a laptop. You just have to know how to choose the right enclosure. Not only in the interests of protecting your drive, but also ensuring full compatibility, and the lack of any bottleneck within your build. Finding a great enclosure is actually pretty simple. You want to be certain your drive will fit inside, and the enclosure won’t use connections which throttle your bandwidth. 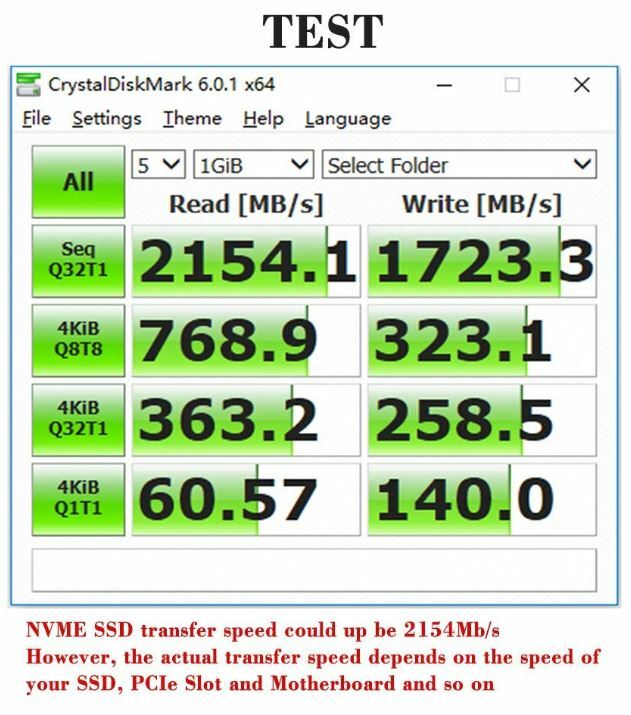 Having slightly inferior internal connections, it’s easy for an otherwise fast NVMe SSD to be throttled by as much as 20%. It’s a bit like running a sports car with watered down gasoline, and it’s terribly easy to avoid. You want to ensure some basic things about compatibility. This stuff is mostly easy. For example, you want to ensure the enclosure supports the right keys for your drive. Different M.2 modules make use of different keys. These keys allow for a particular type of connection, like USB, SATA, DisplayPort, and so on. One card might have several keys. Choosing a USB Type-C enclosure narrows down your selection quickly. But it also ensures your enclosure is all but certain to not support SATA based connections. There aren’t that many manufacturers that make M.2 NVMe drives. And among the ones who do, there are really only a handful of different products. That makes compatibility considerations far simpler because unless you’re using an incredibly obscure or unpopular NVMe SSD, finding the right enclosure will prove rather simple. To summarize, if you’re using one of the Samsung 950PRO or 960Evo series, you’ll have no problem finding what you want. If you are using a more obscure or unpopular drive, then you’ll need to pay more attention to the form factor of the enclosure itself. Another issue adjacent to compatibility is the physical form of the enclosure itself. You need the enclosure to match-up to the drive placed inside of it. Enclosures makes this relatively simple by specifying the type of form factors which they support. The names for each format are relatively undescriptive 4-digit codes, like 2260 or 2280. They look complex, but once you know your drive will fit inside, you don’t need to get lost inside these kind of details. You want an aluminum chassis. If you were expecting your drive to endure horrible abuse, then you might consider some alternative materials. But short of that, you almost certainly want to make use of aluminum. NVMe drives don’t consume terribly high amounts of power, but they do tend to heat up when you use them. Aluminum has magnificent thermal properties, making it excellent at dissipating heat. It doesn’t hurt that aluminum is cheap, either. Using a metallic chassis doesn’t just bring a more attractive design and effective heat dissipation, it can also provide physical protection for your drive and its data. You certainly wouldn’t want to strike even the best USB Type-C enclosures with a hammer. But using the right enclosure, your drive would survive those kind of blows with little more than a dent. The relationship between electronics and heat is pretty well established. Sticking your NVMe drive inside of a tiny box and pumping it full of electricity will create heat. Managing that heat is essential to ensuring the longevity of the drive and your data. When you take care of your drive with reasonable temperatures, you may get years of extra life from it. 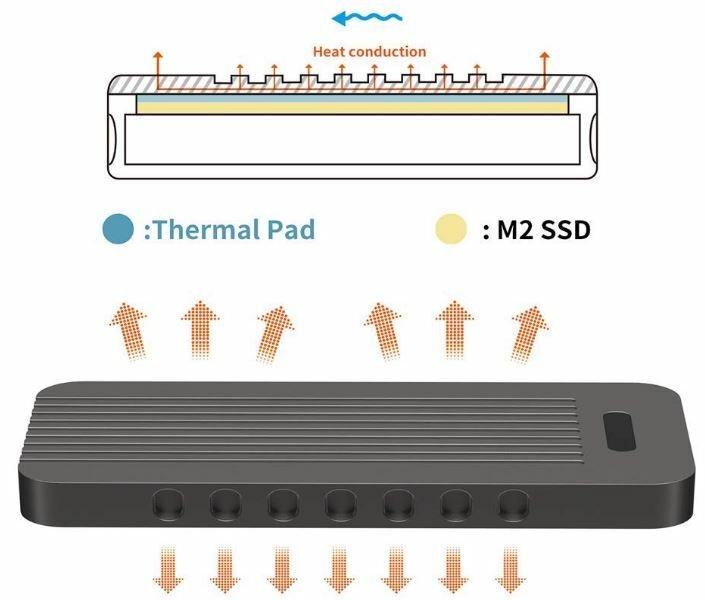 Apart from the material used in the chassis, some of the best USB Type-C enclosures for M.2 NVMe SSD drives go out of their way to dissipate heat in other ways. They might offer cooling vents, or special thermal pads. These extras can be useful to watch for, especially if you have a drive which runs particularly hot. 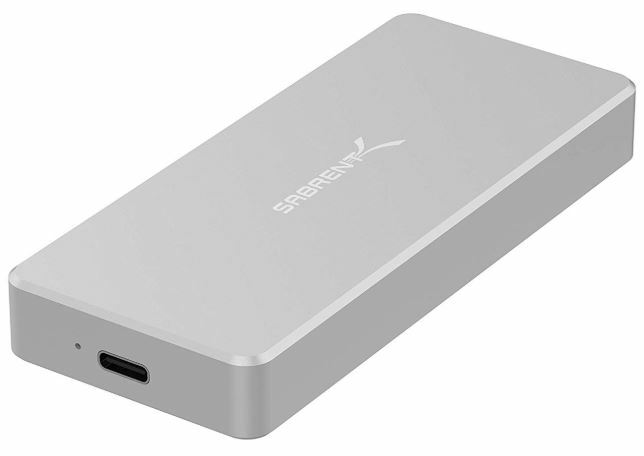 The Sabrent USB Type-C Aluminum Enclosure uses a fairly smart and simple design. Internally you’ll find support for a USB 3.1 Gen2 Port. That allows transmission speeds which reach out towards 10Gbps. In other words, a great way to take advantage of most NVMe drives. This enclosure is also backwards compatible for Gen1 and USB 3.0, though when using those formats, you also invoke their speed limits. And the enclosure is made to be hot-swappable, allowing you to plug and play the drive without installing drivers, or otherwise going into more involved stages of configuration. The Sabrent USB Type-C Aluminum Enclosure measures 4.1 x 1.8 x 0.6 inches, and weighs about half a pound. The chassis is composed of an ultra-slim aluminum alloy, which is finished with a smooth sandblasted shell. The shell is about 9mm thick, making it equal parts durable and portable. Its density also allows it to better work as an effective means of dissipating heat. More effective heat management also translates into marginally better power performance, which can become an issue when you’re using your USB Type-C Enclosure for M.2 NVMe SSD with a battery-powered mobile device. Laptops in particular may see better power performance when you can keep your drive temperatures cooler. But these differences usually only work out to a few minutes of battery life, and are generally not worth obsessing o ver. Apart from providing a protective chassis, the Sabrent USB Type-C Aluminum Enclosure includes a USB-C cable, and Type-C adapter. It also includes a screw set to help secure your drive within the enclosure. And like virtually any similar enclosure, this is a PCIe-based design. It does not support SATA connections. With respect to the drives that can fit inside, you’ll find that you can use virtually any drive within this enclosure. Most notably, it supports Samsung’s full lineup, including the 950 Pro, 960Evo, PM951, PM961, SM951, and SM961. The Acasis M Key NVMe Enclosure is a fairly impressive USB 3.1 Gen1/Gen3 enclosure. It’s effectively an adapter that allows you to use the upper limits of what USB 3.1 Gen2 can offer. That includes the ability to read and write at speeds of 850-1020MB/s, and 10Gbps of bandwidth while using a PCI-e SSD. Naturally, this enclosure also provides backwards compatibility with Gen1 and USB 3.0. From a glance, you’ll be visually impressed with how sturdy the Acasis Enclosure looks. Like any decent enclosure ought to be, this enclosure is constructed from solid aluminum. It measures 6.3 x 4.2 x 1.3 inches, and weighs about half a pound. Like with Sabrent, the aluminum itself is a sandblasted alloy. It feels smooth and pleasant against the skin. Even the mechanically rounded edges are smooth to touch. As a result, the casing simply feels nice in your hands. Unfortunately, there’s no place to attach a lanyard, or otherwise turn the enclosure into something resembling a thumb drive. But that’s a rather minor complaint. The Acasis M Key NVMe Enclosure works just as hard at dissipating heat as it does providing comfort. Its hefty weight is the result of a 9mm layer of aluminum, helping to create effective protection. It also creates a highly effective solution for heat dissipation, though the design provides little in the way of special thermal design. If you’re running an unusually hot drive, you may want to consider a slightly larger enclosure. The Acasis M Key NVMe Enclosure is based on PCIe keys, and supports the most common form factors used by such drives. That includes 2280, 2260, 2242, and 2230. In other words, it covers all of the most of the popular Samsung PRO and EVO drives, Intel’s 600P, 760P, and 900P. 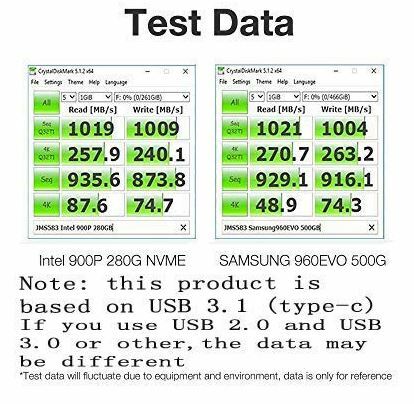 It also covers numerous drives from SK Hynix, Kingston, and virtually every other NVMe SSD manufacturer on the market. Though this should be somewhat expected by now, SATA-based drive connections are not among the supported features for this enclosure. In addition to that rather obvious limitation, this enclosure does not read the WD Black drive. The Acasis M Key NVMe Enclosure includes a USB-C to USB-A Gen2 data cable. The cable is about two feet long. 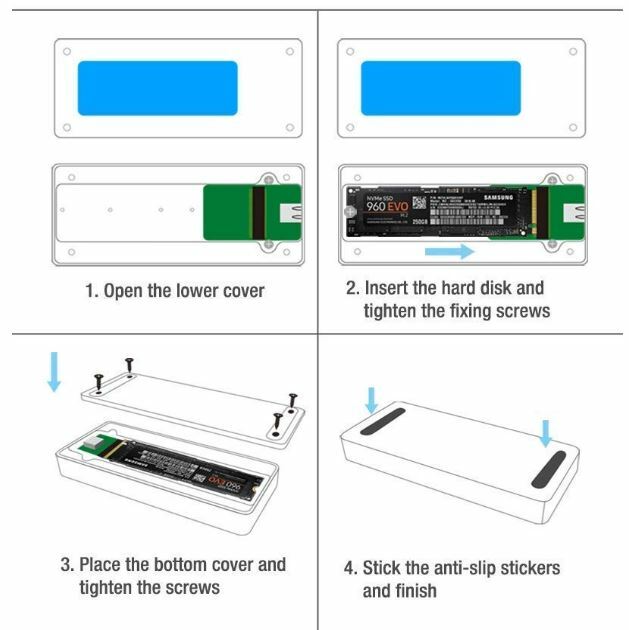 It also includes a USB-to-USB converter, a pair of non-slip silicon pads, five screws to help you install your SSD, and a simple screwdriver to help you get the job done. As with the other enclosures on this list, the SHINESTAR NVMe Enclosure supports a 10Gbps USB 3.1 Gen2 connection. Like you want from any similar enclosure, this chassis allows you to transform your SSD into something capable of lightweight and portable use. Once you’re connected, you’ll enjoy transfer speeds reaching a maximum of 1455Mbps. Naturally, the transfer speeds you end up will depend on the rest of your equipment, like your USB ports, SSD, etc. But if you’re looking for an enclosure that has zero chance of placing a bottleneck on your equipment, this one is worth close examination. The SHINESTAR NVMe Enclosure measures 4.2 x 1.8 x 0.4-inches. By a small margin, that makes this enclosure the most compact option on this list. In a strange twist of irony, in many regards, it’s also the most powerful. From a superficial standpoint, the power-on indicator LED also helps the enclosure stick out. With respect to the quality of its construction, you’ll find it’s rather consistent with the other enclosures on this list. Another all-aluminum body, resistant to wear, and modestly shock-resistant. It uses 9mm of aluminum to help protect the drive, and better dissipate heat. The chassis has been designed with numerous cooling ridges, indented along the edge of the casing. This isn’t simply a stylistic decision; it actually helps create more surface area. In turn, that allows for more effective heat dissipation. Also along the edges of the chassis, you’ll find vent holes strategically placed to further help with cooling. Internally, a small thermal pad helps move heat away from the adapter. It’s this final touch that really pushes the SHINESTAR NVMe Enclosure into the territory of being specialized towards cooling. Whether or not you’re running a sensationally hot drive, effective cooling is hard to ignore. 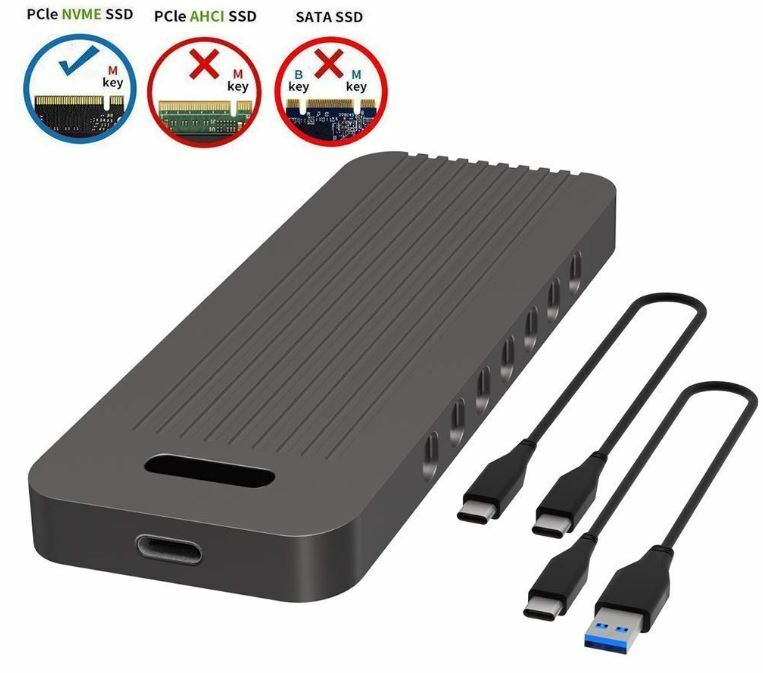 The SHINESTAR NVMe Enclosure includes a Type-C USB 3.0 data cable, and Type-C to Type-C cable. This enclosure makes a USB-C connection, and it supports virtually every PCIe NVMe SSD on the market. That includes support for 2230, 2242, 2260, and 2280. Like the other enclosures on this list, the SHINESTAR NVMe Enclosure makes use of a JMS583 chip. It provides native support for Windows and Mac OS, and it’s what allows this enclosure to be totally plug and play. In other words, you don’t have to bother with installations or drivers. The simplest solution is the Acais M Key NVMe Enclosure. It supports most SSD drives, it has equally deep support for the speeds most people are seeking. Internally bound to about 1020MB/s, the construction of the device is simple, but effective. It’s a good choice if you don’t have any special requirements for your drive. The Sabrent USB Type-C Aluminum Enclosure is another almost universally adaptable design. It’s slightly on the larger side for an enclosure, but the simple no-nonsense design is impossibly easy to use. It supports essentially any NVMe drive you would want to stick inside, and that makes it a good choice for someone who prefers its slightly larger design. Finally, the SHINESTAR NVMe supports the highest bandwidth capabilities of any enclosure on this list, reaching up to 1455Mbps. If you’re using a sensationally fast SSD, or you’re especially worried about heat, then the SHINESTAR NVMe Enclosure is probably your best bet.